Question: What Is Dry Ice? Is It Dangerous? Answer: Dry ice is the common name for the solid form of carbon dioxide. Originally the term 'dry ice' was a trademark for the solid carbon dioxide produced by Prest Air Devices (1925), but now it refers to any solid carbon dioxide. Carbon dioxide is a natural component of air. 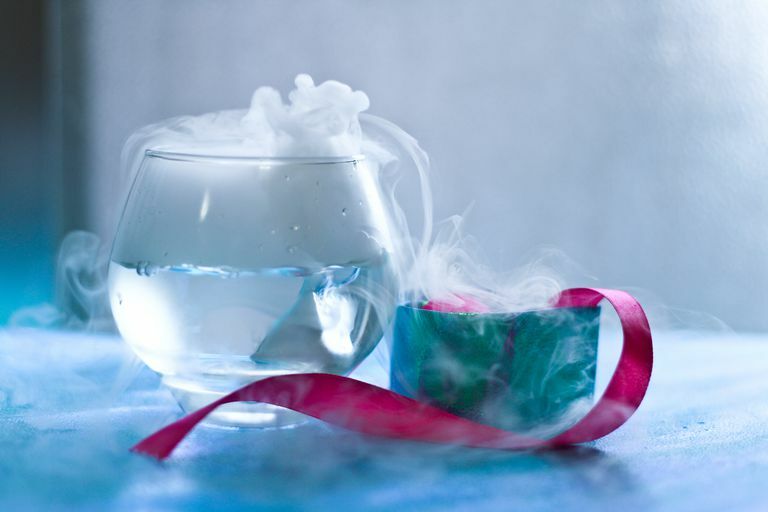 Dry ice is safe to use for smoke machines and lab experiments, providing care is taken to avoid frostbite. Why Is it Called Dry Ice? It's called dry ice because it doesn't melt into a wet liquid. Dry ice sublimates, which means it goes from its solid form directly to its gaseous form. Since it's never wet, it must be dry! Dry ice is made by compressing carbon dioxide gas until it liquefies, which is at about 870 pounds per square inch of pressure at room temperature. When the pressure is released, some of the liquid will transition into a gas, cooling some of the liquid into dry ice frost or snow, which can be collected and pressed into pellets or blocks. This is similar to what happens when you get frost on the nozzle of a CO2 fire extinguisher. The freezing point of carbon dioxide is -109.3°F or -78.5° C, so dry ice won't stay solid for long at room temperature. What Are Some Uses of Dry Ice? Dry ice is used to create smoke and fog special effects. Dry ice is used to freeze and refrigerate items that need to be kept cold. One advantage of using dry ice to cold-pack goods is that it does not melt and make a mess as it warms. Dry ice can blast-clean industrial equipment. Dry ice can be used to seed clouds to induce precipitation.